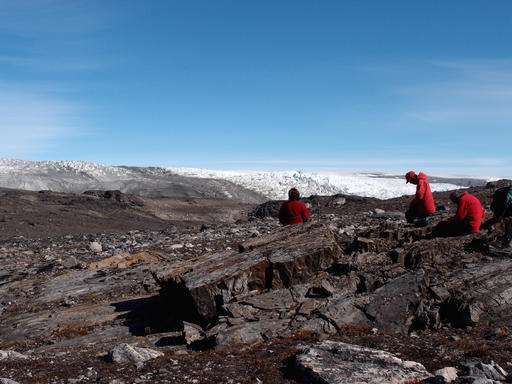 In a newly melted part of Greenland, Australian scientists found the leftover structure from a community of microbes that lived on an ancient seafloor, according to a study in Wednesday's journal Nature . "It gives us an idea how our planet evolved and how life gained a foothold," VanKranendonk said. Scientists had thought it would take at least half a billion years for life to form after the molten Earth started to cool a bit, but this shows it could have happened quicker, he said. That's because the newly found fossil is far too complex to have developed soon after the planet's first life forms, he said. It "is like the house left behind made by the microbes," VanKranendonk said. "It would have been a very different world. It would have had black continents, a green ocean with orange skies," he said. The land was likely black because the cooling lava had no plants, while large amounts of iron made the oceans green. Because the atmosphere had very little oxygen and oxygen is what makes the sky blue, its predominant color would have been orange, he said. The dating seems about right, said Abigail Allwood , a NASA astrobiologist who found the previous oldest fossil, from 3.48 billion years ago, in Australia. But Allwood said she is not completely convinced that what VanKranendonk's team found once was alive. She said the evidence wasn't conclusive enough that it was life and not a geologic quirk. "It would be nice to have more evidence, but in these rocks that's a lot to ask," Allwood said in an email. "Scientists have found what they think is the oldest fossil on Earth"
-Now now I think its a safe bet theres one out there thats at least a week or so older. Pretty freakin' cool if it can be verified. It certainly "looks" like a stromatolite fossil. It's also rather neat that communal organisms much like this are still around today. They seem remarkably successful. Why can't I get the picture out of my mind of aliens whose brains look like stromatolites visiting early earth? Well, this is pushing the timeline of life way back. In some sense, these bacterial mats can be viewed as proto-multi-cellular creatures. "That's because the newly found fossil is far too complex to have developed soon after the planet's first life forms, he said." Panspermia is looking better all the time, especially considering the Late Heavy Bombardment (4.1 to 3.8 billion years ago) didn't end all that much before this fossil formed 3.7 billion years ago. "..Because the atmosphere had very little oxygen and oxygen is what makes the sky blue, its predominant color would have been orange, he said...."
...then he is wrong: false inference. The reason why the sky appears blue is mainly because of the presence of nitrogen, not oxygen. Although oxygen does scatter some blue light thus contribute to the sky being blue, most of the blue color in the modern sky comes from the presence of nitrogen which I presume would have been abundant in the early earth's atmosphere? In any case, regardless of what the color was of the atmosphere of early earth, an atmosphere can appear blue even if it has no oxygen depending on the types of gases and in what proportion the atmosphere does have. Scientists had thought it would take at least half a billion years for life to form after the molten Earth started to cool a bit, but this shows it could have happened quicker, he said. The cool early Earth is fairly established, with oceans before 4.3 billion years ago, and there is no fundamental reason why life didn't emerge then. That would comply with molecular clocks (Bacteria and Archaea split before 4.2 billion years ago) as well as the first putative fossils (before 4.1 billion years ago). @tbgl, regarding transpermia, that is probably right. This favors a panspermian origin beyond the solar system so that life was ready as soon as the Earth was. This seems possible, or even likely, given the vast amount of suitable time before the solar system formed and the vast amount of impacts scattering rocks (and potentially bacterial passengers) during that time. On Earth, bacteria seem to fill every survivable niche available. It does not seem unreasonable to wonder if that is true in space as well. I find panspermia pretty dubious when you consider how primitive the earliest forms of life seem to be. If life started elsewhere and came here, why would it be so 'simple'? It's not a hard scientific argument, just feels implausible. Like whatever life leaves earth and travels off into space, whatever makes it to the next planet doesn't seem like it'd be anything like the early life of our own planet. a remnant of life from 3.7 billion years ago when Earth's skies were orange and its oceans green. Firstly, it is just physically and chemically impossible for life to "form" all by itself from purely random chemical and physical processes. Such a thought pattern goes against all established scientific principles of chemistry. Furthermore, the earth itself could not have "formed" out of a cloud of dust all by itself. This idea goes against the established principles of physical mechanics. There is absolutely ZERO evidence that planets can arise out of a cloud of dust all by themselves. No one has seen such a thing nor is anyone able to confirm it can happen. It is better than the "mythical assumtion" (if ever there was one!) that some god or other did it! Numerous experiments have shown that Earth analog atmospheres from this date can provide the precursors to life. So, more evidence than the "god did it" brigade. As for planets coming from dust clouds; perhaps you should look at the various images that have been seen of planets forming in just such dust clouds around other stars. Again, more evidence than anyone else has to offer. @Mark: Okay, but panspermia is unrealistic due to the vast distances. So I don't think that goes anywhere. @tinnitus: - It isn't "too" tiny, stromatolites don't have a minimum size until they can't be distinguished from the variance in surrounding bacterial mats. Also, I still haven't read the paper, but other images show lamination. - There is no evidence of life (cells, viruses) 'raining down' from space, obviously, That would be huge news. To repeat myself, early emergence put transpermia in tension. And panspermia is unrealistic. @Fred: - This work is no different in scope than related work. See the article. It is your claim of 'story telling' that is story telling. Bad story telling, easily revealed as such. - It is no more 'impossible' for life to emerge than when the planet itself emerged. In fact, a major theory predicts that these processes are related, and it is tested by similar outcomes on Enceladus (serpentinization and organics from primordial geology). If you are going to discuss science, you should do due diligence and check on these things. Before making claims that are obviously erroneous for most readers, and easy enough to check with google in a few seconds. Another thing, you keep repeating claims that has been shown to you are wrong. Dumb or 'evil'? I was wondering if a planetary fragment could contain enough uranium to heat it's interior enough to sustain liquid water. I searched a little bit and found nothing. A collision could sent fragments on interstellar paths. There's also the possibility that spores or something similar could survive the journey.